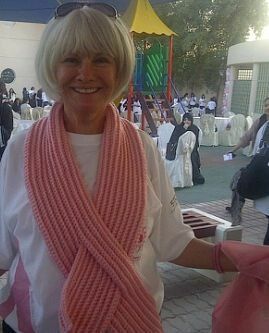 The Walk for Cure-a walkathon for Breast Cancer Awareness was arranged this Thursday in Riyadh at the Kingdom school. The concept of a walkathon for supporting breast cancer awareness comes from the U.S where numerous such walks have been organized. I was really looking forward to this event as I'm always eager to promote women's rights and issues and curious to see how it had been arranged by the group of local women. I was anticipating a pleasant and relaxing afternoon and getting some high quality pics to share with the world but it turned out something totally different. When I arrived at the event with my mom the honest, obsessive-compulsively rule-following inner-Finn in me whispered into in my ears, "you should ask permission" "you must obey the rules". I tried to fight saying chillax, it's Saudi, honesty and going by the rules don't always go down like that. But the inner-Finn won the battle and I approached the people involved in arranging the event. BIG MISTAKE, huge. Naturally I'm aware of how some Saudi women feel about photos, especially in women only events. However, having attended many such events, I knew women often took pictures with their iPhones and small compact cameras without any disturbance from on-lookers. I always thought Saudis thought images taken with anything other than a so called professional camera were in fact, not images at all. I told the women involved in organizing the event that I would like to take some pics to promote the event and spread the message. I underlined the fact that I would just shoot places and things, not women. I mentioned I work with an agency that sells photos to various international media about interesting events in the Middle-East, and this would be a great chance to promote their event. The woman I talked to started the blah blah blah of how Saudi women feel about photography. I stressed I would not shoot women. I was told they already have volunteer photographers there and they could send me the pics. So photography is going on at the event. Wait, didn't you just say the women were so bothered by it? She wondered why they hadn't confiscated my camera at the door. I told this person I obviously can't send other peoples pics to the agency as my own. I think I'm a pretty decent photographer, so I asked can I be one of those volunteers and share all my pics with them? Again, no. We already have seven. Really, seven? So you have photographers in every corner taking pictures here, why can't I do it too? Because of how some women feel, apparently. Well I'm sorry but those women just need to get over themselves. I am not going to shoot you in your pink jumpsuit or show your heavily make-uped faces and huge hairdos. As if I have no respect and dignity. I'm here for the important cause and wish to promote it. Not to violate faces. I mentioned to this person how I wanted to at least just shoot the floating lanterns. No, it's not allowed. Come on it's LANTERNS not women. Geez. I had envisioned an image of hands simultaneously lifting the floating Chinese lanterns into the sky, maybe having a slow shutter speed to make it look a little hazy to capture the movement. But I should have known better. It's just beyond me why the organizers didn't want to promote their event and the cause as much as possible worldwide. This indifference is the typical Saudi attitude for anything remotely interesting, it seems. I bet it would do a lot of good for foreigners to see that such events do go on in Saudi, and best yet, the event is arranged by Saudi women. So it would spread a positive picture of Saudi women as doers and makers and also of Saudi in general, in addition to the actual event. No but let's just keep to the bleak, joyless, confined image of Saudi women's life the rest of the world has. Why show anything positive? I was pretty annoyed at this point. I tried to stay positive anyway and enjoy the event. So we went in the hall where they had a few booths selling some pink items and then other educational ones teaching women about breast cancer. We bought some things and took brochures. The best booth by far was the U.S embassy health services booth. They had some rubber breasts you could palpate and try to detect the tumors. I had already noticed Saudis and women of various other nationalities snapping away with all sorts of capturing devices that don't produce real images. Oh look it's me and the flower arrangement. Snap. Or look I bought this pink hairband! Snap. No one seemed to care. My annoyance grew but I kept my camera confined because the uber-honest inner-Finn still had the power over me. At the U.S embassy booth my irritation levels topped off when I saw a large group of women start taking group pictures. Saudi women were around. Again, nobody really cared, or at least said anything. I kept my camera in my bag but my fingers were burning to take it out. After a few minutes the U.S ambassador's wife came to join them and the joyful photo shoot session continued. My irritation grew to the point I felt if I was a teapot my lid would fly in the air because of the steam in my head. Mom was pretty annoyed by all this too. She knew that I was missing a great job opportunity as well as the this whole no photos thing was turning out to be a complete joke. We spent a few minutes talking to the embassy people, they were so nice and professional. Then something just clicked (not my camera, but perhaps the honest inner-Finn fainted from all the rule breaking going on) and I thought to myself why not just shoot a few photos here? So I asked the women and they agreed. The photo is not even that great because I was scared to use a flash in fear of being exposed and then jumped on by Saudi anti-camera activists, plus I had my wide angle lens on which distorted the photo a bit. Luckily, no assaults occurred and my confidence grew a bit. I had stopped hearing my inner-Finn ranting about obeying rules and had started to feel more Saudi. So we went outside to sit on the nice chairs there and I walked to the end where there was no people. Like a criminal, I crept behind the chairs taking some pics of the flowers. I felt ridiculous. Seriously, people like I was committing the biggest crime. Those pics turned out acceptable. Mom was too tired and freezing (unacceptable for a Finnish woman used to swimming in frozen lakes without sauna) to take the actual walk so we stayed behind as the women left. Again, I had envisioned how I would portray the actual walk without face violations. I wanted to capture the feet of a large group of the women walking, again capturing the motion and the different colors of shoes. But that was just wishful thinking. I did have one picture opportunity of the walk as I watched the women far away pass a "Think Pink" sign. I focused with my mega zoom onto the sign and the women walking past behind the fence remained unrecognizable blurry figures. My heart was pounding. I felt like a sniper. Since most women were walking I took my chance to go back in and took a few pics of the items on sale with my iPhone. I won't post them on here because you would not be able to see them anyways. I came back to the table to find this scene: One annoyed and freezing mother, pink flowers and women walking in the background. So I thought it's time to take a break. We went home which was in the neighborhood to breastfeed my baby, the plan being to return at 7 for the much awaited event, the launching of the Chinese floating lanterns. I had been looking forward to it the whole week so I was pretty excited. We returned a little before seven, in accordance to what the woman responsible for the event programme had told us, only to realize the whole event was already finished. WTH? I wanted to take my STC freebie stress ball out and squeeze the life out of it. I felt temped to confront this "expert". I could not believe they had told us the wrong time. How unprofessional and above all annoying, which went well with the theme of the day. No floating lanterns for us. I bet it was beautiful though. Note to self: Next time mute the honest inner-Finn and act more Saudi. Grr!! It's so frustrating when women do that! Notice, it happens especially when you have a huge camera/lens. For what it's worth, from my experience, even when you're appointed official photographer, they give you crap about it. I've been hired to shoot weddings where I was asked NOT to take pictures!! Anyway, you're not breaking any rules. Sniper away. Good for you, I'm from Saudi Arabia but I currently live in the sunshine state California in Los Angeles to be more spastic enough said. I know how some of the rules no wait what am i saying most of the rules can be annoying,frustrating and irrational.My advice to you is to always think positive and never let anyone let put you down .My favorite part of this story (review) and I quote. "the honest, obsessive-compulsively rule-following inner-Finn in me whispered into my ears, "you should ask permission" " you should obey the rules". Really cracked me up.Yeah and one other thing one of the worst thing is to be obsessive and compulsive,life is too short so enjoy it as much as you possibly can. Oh,i forgot to tell you happy thanksgiving,i hope you had a juicy and tender turkey.always roast it,my friends and i ( i mostly) tried to deep fry the turkey it was a disaster! by all means story short I almost burned my house down the backyard was a total mess the tree was set on fire but we managed to kick the turkey and the cocking pot into the swimming pool but we called the fire department to un set the fire, so the police,fire department and the fire ambulance all came and some of the neighbors come and they were lighting at what happened .they gave me a huge fine to pay for there serves on thanksgiving day and for being recluse as they stetted. Heeeej, you got to let go of the Finn in you :D! You're in the Middle East. Only use the Finn when you can benefit from it :). As a Swede in the Middle East I know the thoughts that come to mind when confronted with certain situations...many times things just don't make sense...to us. Diana-Nessreen-but what CAN you shoot at weddings? Flowers and food? How does it go, do you have to ask beforehand who you can photograph, and afterwards will they want the memory card to themselves? WHat about photoshopping, do you get requests to use it with a heavy hand, make the skin white and so on? I am thinking I could go into this field, but would you recommend it? Hi Faisal and thank you for your awesome comments. Well it looks like you had an interesting and memorable thanksgiving then! I have never heard of a deep fried turkey. What happened to the turkey, did you still manage to eat it? and btw I'm a positive person most of the time :)It's just a Finnish trait to be obsessively obedient and follow rules. Finns are all like that, we cant help ourselves. miolann-thanks, seeing all your comments cheered me up! Om Lujain-ya, I have to take a more Saudi stance from now on. Actually, I usually do. I don't know what got into me. Maybe it was because I was with my mom..Unfortunately she hasn't had the best experience from Saudi. Sakhina thanks for your comment and welcome to my blog! Where are in the ME? Right now I cant think of any situations the inner Finn would come in handy in..any suggestions? the main reason why all your requests were denied,is mainly to avoid liability incase anything went wrong,yes,saudi women are conspiracy theorists too,that make up on the pink suits makes them suddenly feel kardashians and all the camera holders suddenly turn paparazzi on them. i bet if you did not even blink at them and just shot away what you wanted,no one would have approached you out of fear that you are a diplomat,or the mere fact that you are western,which are above the law,according to them. there is a rule that seems to be golden here in saudi : Do what you want,as long as i dont "see" you. if you havent spoken to her,she wouldnt have "seen" you. take it easy,chances will come again. but to be very honest,this is one of the major reasons why i kept my photography a hobby,and didnt seek it as a profession,and now in the US i am having a hardtime getting over it. Whats funny is.. when in Saudi and I have my canon out (my husband got it for me a few years ago as a gift as he knows how much I love taking pictures).. I feel like a criminal.. I LOVE taking photos.. I love photography... but this country killed it :( Its to the point that when I am abroad.. I always think twice about what I am taking a picture of... hesitant to take a pic that may include someone (something people usually don't even think about)... I heard there was a photography club here I wanted to join a while back.. but after thinking.. I gave up on the idea... what is the point of taking photo's without pleasure.. and while constantly being freaked out if some one is gonna come yell at you for taking a pic of his wifes barely visible eyes!!! lol.. Dentographer.. I loved your Kardashian comment.. hahaha.. sooo true! Love the Kardashian comparison, you are so right! Some of the girls there sure had the "kardashian" thingy going on. You know huge hair, make-up, dark glasses and high heels..hmmm not sure what they were doing at a charity event in the first place. Om Lujain-I'm sorry to hear that you feel so anxious about photography in Saudi..
For me I used to feel that way too. Then I just started being more confident and ignoring the stares. Things got much easier and I think if you just act like you are professional and know what you're doing, no one will say anything. I still don't know what came into me at this event. Well other than that annoying inner-Finn. I do enjoy your blog and your photos but I was disappointed with this post. i felt like all the focus was on your disappointment in not being able to take the kind of photos you wished instead of writing about the importance of such an event in Saudi with support and attendance by Saudi women. What can I say... breast cancer is a very sensitive subject to me and I feel it should not be minimized. Thanks very much for your comment and I totally understand your point of view. However, the point of this post was not to write about the event or breast cancer awareness per se, but mainly the issue of photography and my disappointment was from not being able to spread the cause through it. Maybe the title is misleading.. but by NO means is this post about minimizing the importance of the subject. The reason we wanted to go was to support the campaign. And that's the bottom line. My two aunts (moms only alive sisters after one died from cancer) were emergency operated on for breast cancer last week, on the SAME day. It was really a tough time for my mother, they told us after the operation was over. I can't say I take this cause lightly or wish to minimize it. BY taking those pics and forwarding them I wanted to spread the word and awareness. Especially because the campaign was held by Saudi women, it would have been extra important to me. I was so disappointed that it did not happen, because I think such an event deserves international media attention. Thanks Layla for your response! hey. I think ur giving people a wrong picture about Saudi Arabia.